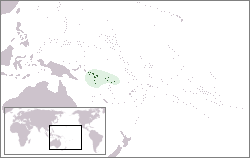 'S e dùthaich eileanach a tha anns na h-Eileanan Sholaimh (Beurla: Solomon Islands). Tha i na laighe ann an Roinn a' Chuain Shèimh san taobh an ear air Papua Gini-Nuadh. Tha faisg air millean eilean ann. Tha am prìomh-bhaile, Honiara, na laighe air an Eilean Ghuadalcanal. Air a tharraing à "https://gd.wikipedia.org/w/index.php?title=Na_h-Eileanan_Sholaimh&oldid=527684"
Chaidh an duilleag seo a dheasachadh 5 dhen Ghearran 2017 aig 16:05 turas mu dheireadh.